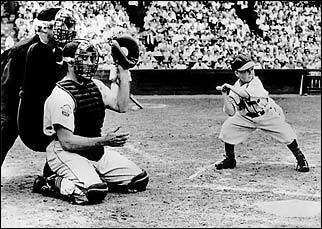 the first, the Browns sent up a pinch hitter -- a 26 year old rookie -- 3' 7", 65 pound Eddie Gaedel. Eddie -- in a borrowed uniform (made for the son of one of the owners) -- and a toy bat, faced Detroit left-hander Bob Cain. Cain threw four pitches to the crouching Gaedel. Four balls. It's said that Veeck had told Gaedel that he had a sniper in the stands and he would fire if Eddie swung at a pitch. Gaedel was replaced by a pinch runner. It was his only appearance in the major leagues. The uniform -- number 1/8 -- is in the Hall of Fame. Founded in 1998, Gaedel is going into its 22nd season. The RMT Taxsavers of Michael Rosenswig and Jon Dawe galloped through the regular season with 102 wins and whipped the Taylor Wilson's defending champions in just five games in the playoff final. Gaedel expanded to 12 teams for the 2001 season and owners competed in three divisions (Pete Gray, Moonlight Graham, Bert Shepard) with names in the Gaedel theme. The loop contracted to 10 teams for the 2009 campaign. It's a perpetual league with teams allowed to protect 15 players (plus 4 rookies) from year to year. Eddie Gaedel Edward Carl Gaedel (guh-DELL) was the centrepiece of Bill Veeck's (Veeck as in Wreck he would say) best remembered stunt. It was August 19th, 1951.